It may be useful to stop thinking of this presidential campaign as a contest between Democrats and Republicans. Hillary Clinton is a Democrat. Donald Trump is also a Democrat. Come on, you know it's true. This isn't a political race, it's a class race. Take a look at his economic policies. They are certainly more in line with traditional Democratic thinking than they are with Republican orthodoxy. 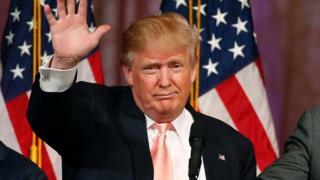 Mr Trump opposes free trade deals - that's anathema to many conservatives. Make way the old TPP, the Trans-Pacific Partnership. Here comes the new TPP, the Trump Protectionist Party, which promises to do whatever it takes to protect American manufacturing jobs, even if it means slapping massive tariffs on China, Japan and Mexico. Even if it means a trade war. Last September Mr Trump released a tax plan that calls for higher taxes on the wealthy - a suggestion that would have disqualified any other recent Republican candidate. Image caption Donald Trump has positions that no other Republican candidate could "get away with"
He even said of his own policy that it would cost him a fortune. He is not a deficit hawk, and has promised to protect welfare programmes such as social security and Medicare. Since deficit reduction was the litmus test of true conservatism in the 2012 campaign, Mr Trump's position is pretty staggering. He is even squishy on some social issues. He has kind things to say about Planned Parenthood - a federally funded women's health organisation which is seen as the devil incarnate by many social conservatives because it provides abortions. Mr Trump says he doesn't like the abortions but the organisation itself does a lot of "wonderful" things. Again, no other Republican candidate would be able to say this and get away with it. Where Donald Trump is not in line with Democratic thinking is on anything to do with minorities, whether they are Hispanic, Muslim or female. Those are the issues on which his views cleave him firmly away from most Democrats. That divisive rhetoric aside (and I am by no means minimising the importance of the wall, the ban and sexism), Mr Trump's views are more in line with the American centre left than the American right. Which explains why some people can't choose between Donald Trump and Bernie Sanders. In some ways he is reminiscent of the British Labour party circa 1980. A much more useful lens through which to view this election is that of class. This isn't exactly a class war - that's too European for the US - but it is a class election. And indeed a race election. In the states that he has won, Mr Trump draws the clear majority of his support from working-class men who are white. People without a college education who feel that the economic policies of free trade and low taxes on the wealthy have not helped them. And they are quite right. Manufacturing wages in America have been almost stagnant since the 1970s. If you are a 55-year-old auto worker who has lost your job to an immigrant or - far more likely - a robot, you don't just feel left behind by the forces of globalisation and low taxes, you really have been left behind. The very economic policies that have defined the Republican party for the past two decades have not helped the working class here to adjust to a globalised economy and a technological revolution. In fact one of the mysteries of American politics has been why working-class voters have repeatedly voted against their own economic interests by voting Republican at all - a party which has cut welfare nets, reduced trade barriers and lowered taxes on the wealthy. There has simply not been enough trickle growth from those policies to raise working-class wages. Add to this bleak economic picture a growing gender imbalance in the US - women are better-educated than men and increasingly earn more than their husbands - and it's not at all surprising that you find a section of the population that is feeling, well, rather emasculated. Throw in affirmative action programmes and immigration policies that they believe have unfairly benefited minorities at the expense of white people and you quickly get anger too. The white working-class American man is dangerously disaffected. In this context, Mr Trump's appeal is far more understandable. He is offering plans that make sense to people who have been marginalised by global competition and Republican economics. And just as important, he promises to restore their pride, to make them winners again. If you feel you've had a bad deal, that's a very seductive offer, whether you call yourself a Republican or a Democrat. Whether he can deliver or not is an entirely different question.